Very Positive (20) - 90% of the 20 user reviews in the last 30 days are positive. Very Positive (241) - 86% of the 241 user reviews for this game are positive. Hi ! I hope you are all having fun rock crawling ! Smaller update to address few issues. Big thanks to the community for suggestions and bug finding ! Take care ! I took some time to rework the lighting on all maps, to better suit the overall look of the game. I hope the game now feels more toned down and much more realistic :) As I was changing this stuff I went ahead and change some vegetation on spring maps, as much as I am in new maps I think that the game really will benefit from this change and help the old maps not stand out so much. car physics should be more responsive now, there was linear drag applied to car body causing it to "float" when moving faster. And now... lets sum up this year ! And that's all thanks to all of you. Pushing me to make new things, fix the old ones, really that means a lot. I may be not the most communicative dev, but i hope you feel that i am reading every suggestion and comment, and that i am truly committed to this as an Early Access where players have impact on the game. That being said, Pure Rock Crawling will remain in Early Access for now. It would be wasted opportunity to leave it too soon, when the game still can benefit from players suggestions. rework customization, I want to make something that would really let you feel like building dream rock crawler. Different tire sizes/types, axles that actually change something, being able to chose between spring or leaf suspension, more cosmetic items etc., so that's something that i want to work hard on. Looking back on how much Pure Rock Crawling changed in the past 12 months i am sure there is much more to come !!! Thank you all for the support ! Cheers and have fun ! 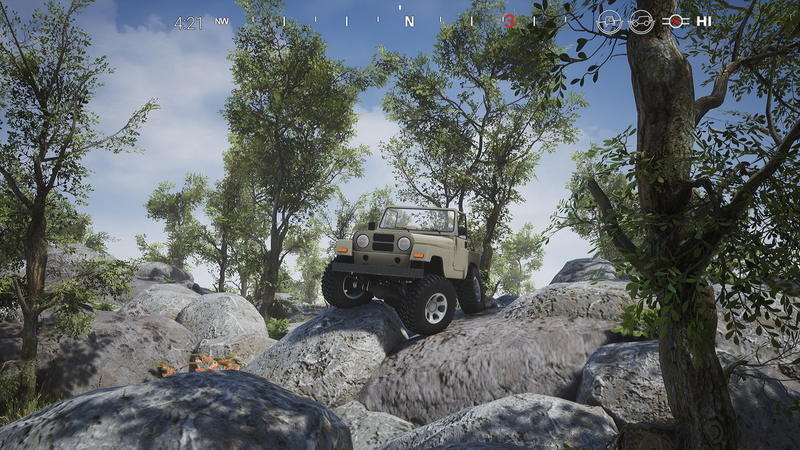 PURE ROCK CRAWLING - Flexible tires, simulated suspension and more ! The challenge is simple: on trail you will find ten gates composed of two cones, none of which should be touched or tripped. For every gate passed you will be awarded with points, for every cone tripped you will loose them. Be precise and concentrated to gather as much points as you can, but be aware of the ticking clock. You have only 5 minutes to complete each stage, so be carefull with the throttle ! Too much or too little can doom you. Pure Rock Crawling encourages you to take on this challenge to unlock new maps and vehicles. Pure Rock Crawling uses the Unreal® Engine. Unreal® is a trademark or registered trademark of Epic Games, Inc. in the United States of America and elsewhere. Unreal® Engine, Copyright 1998 – 2018, Epic Games, Inc. All rights reserved.